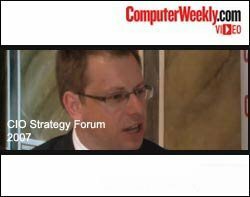 In our latest video, ComputerWeekly.com interviews senior figures in the IT industry about the most pressing challenges facing Chief Information Officers (CIO) and IT leaders in today's complex business environment. Interviews take place at at the Brewery in London earlier this year, where senior figures of the IT industry had gathered for the World Trade Group's CIO Strategy Forum called Increasing Corporate Power Through IT Leadership. Interviewees include Martin Wickham, CIO of BT Ireland; Sue Powers, CIO of Worldspan; Claudia Natanson, CISO Diageo; Ramesh Harji, director of Business Information Management at Capgemini; and Alistair Russell, director of the IMPACT programme, the National Computing Centre. To find out their views watch the video.